Angkor Wat is a temple complex in Cambodia and the largest religious monument in the world. Angkor Wat is the ultimate expression of Khmer genius - an awe-inspiring temple that is stunning for both its grand scale and its incredible detail. 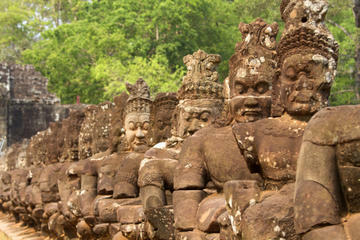 A visit to Cambodia's World Heritage Temples of Angkor complex is understandably high on the list for many travelers. Angkor Wat was built by Suryavarman II and is the earthly representation of Mt Meru, the Mt Olympus of the Hindu faith and the abode of ancient gods. The temple is the heart and soul of Cambodia and a source of fierce national pride. Unlike the other Angkor monuments, it was never abandoned to the elements and has been in virtually continuous use since it was built. With so much history and culture, Abgkor Wat is a great place to experience, and there are several options for exciting tours to get the most out of your visit to the area. The ancient crumbling structures that make up the Angkor temple complex rank among the world's most impressive and iconic ruins. Spend the day exploring this vast landscape just outside the town of Siem Reap on this Angkor Wat Ancient Temples Full-Day Tour. Venture into the ceremonial structures, which are tucked amid towering trees and quiet clearings. 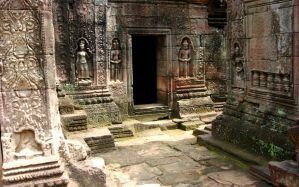 Built between the 9th and 13th centuries by the Khmer Empire, they remain today as a reminder to the nation's regal past. Enjoy private transportation from your hotel to the Roluos Temple Group, where you'll see the oldest remaining structures in the complex. Savor a typical lunch in Siem Reap and then take a two-and-a-half-hour tour through the iconic Angkor Wat. End this memorable day with a climb to the top of Phnom Bakheng, where you'll enjoy epic sunset views of Angkor Wat and the vast Cambodian countryside. Follow the Grand Circuit of Angkor, laid out by the French in the 20th century, and take in the amazing sites around the ancient Angkor City on this full-day photo tour. Start at Siem Reap at 4:30 or 5:00 in the morning, and make your way to Angkor Wat to relish in the beauty of a sunrise over Angkor. Take beautiful photographs from the western end of the main building of Angkor Wat, have a delicious breakfast opposite the entrance to the temple, then go to explore Prasat Kravan temple and the Reservoir of Sras Srang, also known as the Royal Baths. Discover the peaceful temple of Banteay Kdei as you enjoy the energizing morning light, visit what used to be an island in the vast Eastern Baray reservoir at the Pre Rup and East Mebon brick temples, and enjoy a fantastic restaurant lunch. After lunch, visit the North Gate of Angkor Thom and spend the rest of the afternoon in the spectacular Preah Khan Temple with its tree-clad ruins and unique atmosphere. Greet your guide in a central Siem Reap location and travel through the outskirts of the city to the glittering Tonle Sap Lake. Climb aboard your awaiting boat and cruise over the shimmering surface; see floating fishing villages in which schools, shops and hospitals function together and gasp as you sail past farms of fearsome crocodiles. Allow your guide to direct your attention to rare and endangered water birds and hear of how the lake's water changes direction twice a year. See half of Cambodia's fish supply flounder beneath the surface and then return to dry land and venture to a provincial nearby village for a culturally enriching experience. 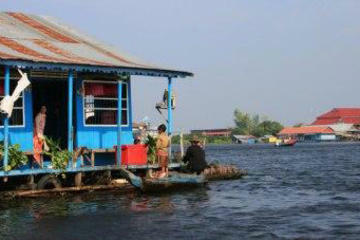 Chat with locals, sample local Cambodian delicacies and visit a Buddhist temple to absorb the sacred atmosphere. Return to your remork and head back to a central city location, where the tour concludes. Your authentic Siem Reap evening starts off with a ride on a moto-remork, an articulated moto-rickshaw that's commonly seen on Siem Reap's streets. you'll zip through the streets, off the tourist trail and straight into local street heaven. Your food-loving local guide will uncover hidden local street food treasures and beloved recommendations of local snacks, such as yellow bean cake or Khmer rice cake. Your food mission continues with a tasting of seasonal fruits that are grown in and around Siem Reap, like the dragon fruit, mango, tiny pineapple, and the stinky king of all fruit - the mighty durian. You'll also see the spices and other ingredients featured in local food, and hear about the traditional remedies and medicine. Next, hit up a local picnic spot where stalls are set up in the early evening selling a multitude of interesting snacks. As you wander around, you might see fried tarantulas, which are usually enjoyed with a cold beer; fried crickets, which taste like potato chips; barbecued meat on skewers; Khmer Fried Chicken; green mango served with chili and salt; ducks eggs; barbecued corn; and deliciously sweet purple mangosteen. Your next stop is a local restaurant to sample some tasty local delicacies, before finishing at a dessert stall where fruit shakes, fruit with sweeten condensed milk and baked puddings are the specialty. After dinner, you'll have the option to return to your hotel or end your Siem Reap food tour at Pub Street that's perfect for exploring local bar and cafe life.